Friendship Day is all about remembering old days. What is friendship according to you? I think, We can see a real example of true friendship in the famous Hindu epic "Mahabharata". Lord Krishna demonstrates the many colours of friendship like affection,romance, brotherhood, protection, Guidance, intimacy and even teasing. Friendship is something which starts from school days and remains till last breath of life.Those stupid fights over lunch boxes, complimenting each other, supports completely, giving friendship bands, annoying each others, crying together and many more. When you down with breakup, then friend is something who hold your hand and says he/she is not worthy of you. Friends plays an important role in our life.The only people in the entire world you can expect to be brutally honest with you are this bunch of idiots. Not even humans but animals can also be best friends. They fill our emptiness with their love and trust.So one day is not enough to celebrate this awesome day. Considering the valuable role friends play in our life found it on 1935 when the US congress decided to dedicate a day in honor of friends. Though it is not known exactly what were the reasons of making this day but with the devastating effects of the first world war still showing and increasing hostilities and hatred between countries. So, there were a huge need for friendship so that they could understand the feel and love about friendship in their life. Therefore, the US congress decided to designate the first Sunday of the month of August as Friendship Day and with a formal proclamation in 1935 Official declared the occasion a holiday dedicated in the honor of friends and friendship. the youngsters among the countries. Friendship day is enthusiastically celebrated by several countries across the world including India. In 1997, the United Nations named Winnie-the Pooh as the World's Ambassador of Friendship. 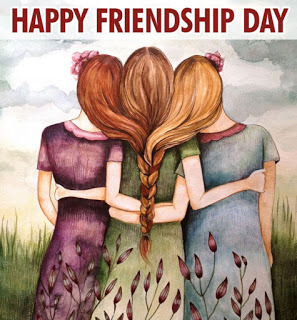 Though started in the US and initially a part of only western countries Friendship Day is no celebrated worldwide including India to cherish the beautiful relationship called Friendship. In India people dedicate this festival to their best friends. They usually prefer celebrating this day by spending the entire day with their best of buddies. The section of the society most enthusiastic about this day is the youth and the schools and colleges become the major part of it. Exchanging of friendship bands, friendship cards, gifts and chocolates are common practises. Friends meet each other and tie the friendship band around their friend's wrist. The malls, discotheques and pubs pubs are popular places to hangouts. - Friendship Day SMS: SMS is also an another way for wishing you loved ones on friendship day. They are quite popular among all ages in the contemporary times because they are short yet impressive. Sending a lovely friendship day SMS on this occasion is a wonderful way to make your friend feel elevated. - A Surprise Party: Throwing a surprise party for all your close friends on Friendship day would be much fun.Such surprise parties on the occasion would refresh the bond in the busy life. - Personalised Gifts: This great gift idea to amuse your your friend as it also signifies as a token of love and friendship for the years to come. - At times we get busy in our daily lives we start taking our friends for granted. - Acknowledge with love the important role the play in our lives. - It is the annual celebration of Friendship Day that reminds us that we must cherish the presence of friends in our lives. - Everyone must celebrate and understand the value of friendship on Friendship day and let their friendship touch to the newer heights. Social media also plays a important role in introducing teens to new friends and connecting them to their existing friend networks. - Some around 76% of teens ages 13 to 17 use social media for making new friends. - Many of teens who have met at least one new friend online. - Teens share their social media username as one of the first pieces of information they share as a way to stay in touch when they meet a brand new friend. Friends have an important role to play in everyone's life. They stand aside you at times when you feel lonely and seek support to recuperate from bad times. To express your appreciation and celebrate the joy of being friend Friendship Day is just the perfect occasion. - Friends are the only creatures on earth who loves you as much as your family or more so friendship day is basically for those friends. - Having a talented is the best thing that can happen to you as friend. They challenge you at every step and inspire you to work harder and be better. - They will never let you cry alone but they would probably cry on yours at the same time with friends. - No one can hurry you while they are there to guard you with all their life as a friend. - If you have friends, you are not lonely. Friends are the very important part of our lives. That's why we celebrate Friendship Day for giving them honor and love. They are the people who stands by our side in every situation of life. Hence, Friendship Day helps us to give regards to those insane friends who never judge and misunderstand us.